The Tokyo 2020 Organizing Committee and the United Nations (UN) have signed a letter of intent aimed at promoting the contribution of sport to sustainable development. 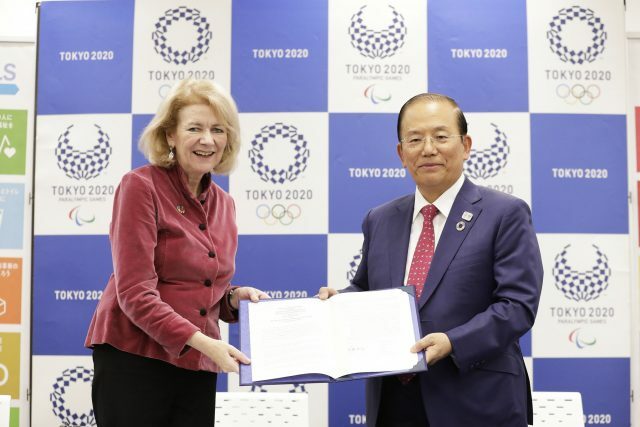 Alison Smale, the UN under-secretary general for global communications, and Toshiro Muto, chief executive of Tokyo 2020, signed the letter on a UN visit to Japan’s capital. They agreed to promote the contribution of sport to sustainable development and, more specifically, work together to achieve the UN’s Sustainable Development Goals (SDGs). The UN’s 17 SDGs are a worldwide call to action to end poverty, protect the planet and create peace and prosperity. There will be a drive to increase the understanding of the SDGs among the Japanese population and the UN’s events and media platforms will be promoted to increase knowledge of the links between the SDGs and sporting events. “I am proud to sign this letter of intent, which will allow us to work with Tokyo 2020 to shine a light not only on the accomplishments of the athletes, but also on how the event is managed in innovative and responsible ways,” said Smale. “This is a great opportunity to leverage our platforms to begin conversations about the contributions of Tokyo 2020 to SDG implementation and the power of the Olympic Games to promote peace and development worldwide. Muto added: “In line with Tokyo 2020’s vision that sport has the power to change the world, we have had a number of discussions regarding our mutual relationship and cooperation with the UN, and we are very pleased to have now signed this letter.